I am excited to announce that from July The Riverhill Trilogy will be republished by Aria Fiction. The books will have shiny new covers as well as being given the once over by one of Aria’s talented editors. I still have a handful of original copies of Slur, A Gangster’s Grip and Danger by Association. These are the books that I published myself as an independent author under the imprint of D M Publishing, and are shown above. So, as a big thank you to my loyal readers I have decided to give away signed paperback copies of these books. There is a limited number of each so I can’t let everyone have a copy – I wish I could. Therefore, I am going to offer the books to readers on my mailing list. If you aren’t already on my mailing list then it’s quick and easy to sign up by following the link: Heather’s Readers. But you’ll have to be quick as I’ll soon be sending out a newsletter letting you know how you can be in with a chance of winning a signed copy of one of these books. I’ll be starting with Slur in April and readers will have to answer a simple question in order to enter the giveaway. I will then select my favourites from those sent in and announce the winners’ names in a future newsletter. 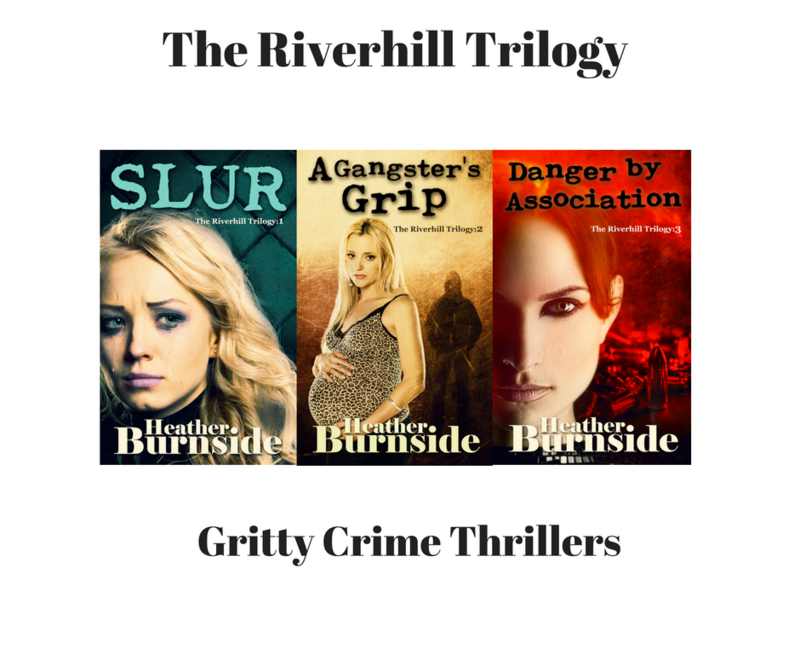 In the run-up to the republishing of The Riverhill Trilogy in July, I’ll then be running a giveaway for A Gangster’s Grip in May followed by a giveaway for Danger by Association in June. As the saying goes, you’ve got to be in it to win it. So, if you haven’t done so already, sign up to my mailing list using the above link then wait for my newsletter to arrive in your mail box in early April. If you fancy a free crime thriller: have a go! That is exciting news Heather. I look forward to receiving your email next month.